It seems that March lion weather has set in around here. When it is stormy outside, nothing tastes better than a steamy bowl of soup. This is one of my favorites because it makes a generous amount, which can be used to make tamale pie a day or two later. 1. Brown beef and onion and drain. 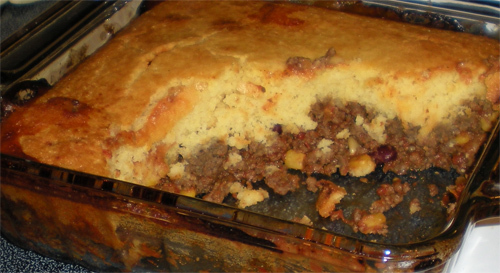 Set aside half for use in the tamale pie. 2. Add canned ingredients and water. Bring to a boil and then simmer for at least 15 min. 3. Garnish soup with chips, cheese, sour cream and olives. Okay, are you ready for this…another dinner that is super easy to throw together–heaven! 1. Prepare corn bread mix according to package directions. 2. 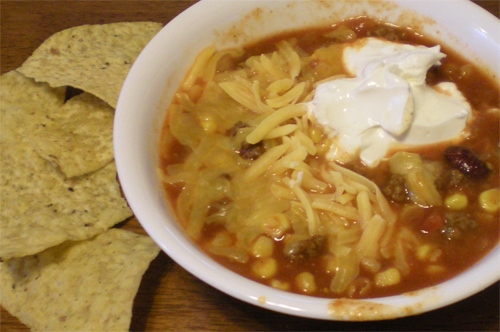 Mix soup and beef in a smaller sized casserole dish. (If you are sparse on soup, you can add more beans. You could also add cheese if you like things extra gooey. I have to say, I like to keep this one pretty simple though.) Pour mix over the top and spread to cover evenly. 3. Bake at 375 for 30-40 minutes or until cornbread is set. 4. If desired, top with cheese, sour cream, and/or olives. I actually like this best just plain and simple….so good! I have to agree with the weather. It’s feeling like soup time again. Great idea for the leftover soup too. I think both recipes will make my menu for next week. Thanks! I like the idea of a tamale pie!! We usually have a boat load of extras too! Yum, I’m excited to try.